Châteauneuf-du-Pape is a commune in the Vaucluse department in the Provence-Alpes-Côte d’Azur region in southeastern France. The village lies about 3 kilometres (1.9 mi) to the east of the Rhône and 12 kilometres (7.5 mi) north of the town of Avignon. In the 2012 census the commune had a population of 2,179. A ruined mediaeval castle sits above the village and dominates the landscape to the south. It was built in the 14th century for Pope John XXII, the second of the popes to reside in Avignon. None of the subsequent Avignon popes stayed in Châteauneuf but after the schism of 1378 the antipope Clement VII sought the security of the castle. With the departure of the popes the castle passed to the archbishop of Avignon, but it was too large and too expensive to maintain and was used as a source of stone for building work in the village. At the time of the Revolution the buildings were sold off and only the donjon was preserved. During the Second World War an attempt was made to demolish the donjon with dynamite but only the northern half was destroyed; the southern half remained intact. Almost all the cultivable land is planted with grapevines. 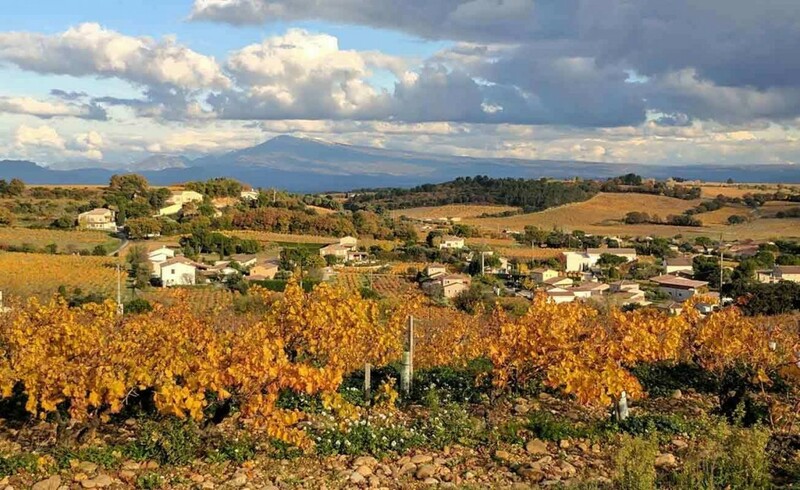 The commune is famous for the production of red wine classified as Châteauneuf-du-Pape Appellation d’origine contrôlée which is produced from grapes grown in the commune of Châteauneuf-du-Pape and in portions of four adjoining communes.